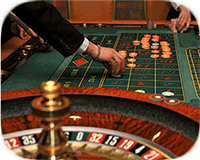 A French word literally translated to “small wheel”, roulette is one of the most popular casino games today and can now be played online at many roulette sites. Roulette is a legendary game undoubtedly, but it also comes with mysterious undertones. The stories about the origin of the game start with a man named Francois Blanc. Such stories state that he made a bargain with the devil so that he would acquire all of the workings and secrets of roulette. This story more than likely generated because all the numbers on the roulette wheel total 666 when they are added together. However, roulette history proved too great for the urban legend and instead historical accounts state that the game was originally concocted by a man from France named Blaise Pascal. The mathematician who lived back in the 17th century, Blaise Pascal was inspired to put the game of roulette together because of his amazing love for perpetual motion devices. And this seems closer to reality since today; people walk into casinos and are simply attracted to roulette wheels without even knowing about the game. While some sources state that Blaise Pascal invented the roulette wheel, other sources state that the game originated in China and was brought to Europe by Dominican monks who were trading with the Chinese. During the late 18th century the Roulette wheel became very popular when Prince Charles (ruler of Monaco at the time introduced gambling to Monacco as a way of alleviating the financial problems of the region. However, the modern version of the Roulette wheel did not appear until 1842 when Frenchmen Francois and Louis Blanc invented the single “0” roulette game. The game was eventually brought to America in the early 1800s. The single “0” modification was eventually rejected in America and the two zeros “00” where returned to the Roulette wheel. The Roulette wheel gained a great deal of popularity in America during the California Gold Rush. But what exactly is roulette? Well for starters, it is in fact a small wheel with numbers that range from 1-36, along with 00 and 0 and the object thereof is to simply guess where, or on which number rather, the ball will land when the wheel stops spinning. How can I increase my odds at winning? For starters there are many betting systems that players have found successful. We have heard positive feedback from the following Hollandish System, Martingale System and the Oscar Grind Vs Another System.